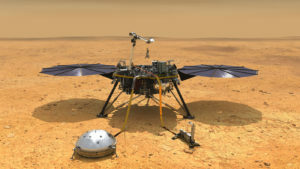 An illustration of the InSight Lander. As the NASA InSight Mars lander successfully touched down on Monday, November 26, 2018, UCLA faculty Chris Russell, Peter Chi, and Caroline Beghein were on the edge of their seats watching their work touch Mars. The InSight mission is focused on studying Mars’ interior, with the help of some Earth, Planetary, and Space Sciences faculty. Russell, Chi, and Beghein are part of the data analysis team studying Marsquakes. On the day of the landing, emotions ran high. 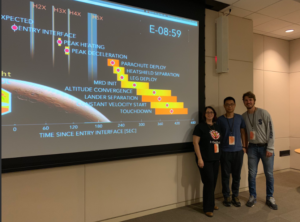 Beghein, a professor in UCLA’s Department of of Earth, Planetary, and Space Sciences (EPSS), joined other team members and her grad students at JPL for the landing party. “I was definitely nervous,” she said, adding that the “tension increased significantly” as piece by piece came together up to the last few minutes before the landing. Peter Chi, a research geophysicist in EPSS and a UCLA alum, has always paid close attention to past Mars missions. However, this one was different. “I was a lot more nervous this time,” Chi said. During the landing, he closely watched the altitude reading of the lander, and began to relax as he sensed a slowdown in the lander’s descent. Although the whole team feels the relief of the successful landing, the work is only beginning. 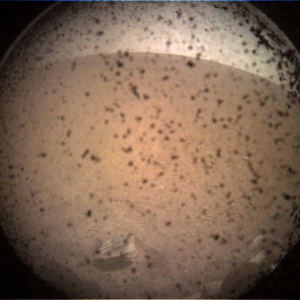 Shortly after landing, the first image from InSight was received, which made it real for many. “I very much look forward to studying the science data,” Chi said. at the JPL landing event. The next steps involve waiting for data to come to Earth, but that does not mean the work is paused. Beghein and her team have begun testing their code on a blind data set to see what model of the interior of Mars they can retrieve. Their code was originally developed for Earth, but they have modified it for Mars applications. Along with his team at UCLA, EPSS professor Chris Russell developed the mission’s magnetometer, which is the first one ever used on the surface of Mars. This will be used to acquire measurements of the magnetic fields on the surface of Mars and protect InSight’s seismometer from being skewed by the magnetic signals. UCLA has a pivotal role not only in the instruments for this mission and the analysis of the data, but also in inspiring these three faculty members and alumni to be a part of such an exciting moment in history. Russell was Chi’s thesis adviser. “I am most indebted to him,” Chi said. Russell and UCLA provided Chi with “valuable opportunities to work on UCLA projects that detect magnetic field variations on the Earth’s surface and study the magnetic field data collected by Apollo experiments on the Moon.” With these experiences, Chi is eager to be a participating scientist and co-investigator of the InSight Mission. from the surface of Mars. The landing was a moment in history and a step toward greater things in the future. For Beghein, the mission shifted her research. She explained that in the past, her work had focused on constraining Earth structure and internal dynamics, but that implementing this knowledge for a mission to Mars “was a dream come true.” Researchers on the team are very aware that this is nowhere near the end. “Hopefully it will open the doors to more geophysics planetary missions in the future,” Beghein said. The first mission to Mars that will probe the interior of the planet. The first measures of magnetic fields on Mars. The first mission to Mars that will focus solely on the deep interior of the planet. The first magnetometer on Mars. And of course, the first piece of UCLA on Mars. So many important moments and so many more to develop with the InSight mission.